This is the stupidest thing on the face of earth. I wasted my money and they don’t refund. This is a paid for app yet it also has a monthly subscript service that enables very trivial but essential features such as email reminders, cloud backup, and web based integration. It simply is not worth paying a monthly fee for the services on top of paying for the up upfront. I had to buy Judy to try, which is s terrible sales tactic. Even the most affordable price for an app is too much if you can’t return it after learning it doesn’t suit your needs. 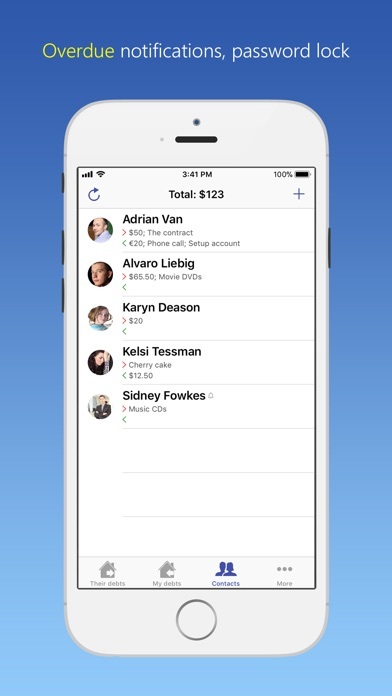 Integration with your address book for email alerts would be a welcome feature as well as integration with your address book for SMS Alerts through twillio ( or similar) could also be a nice feature. 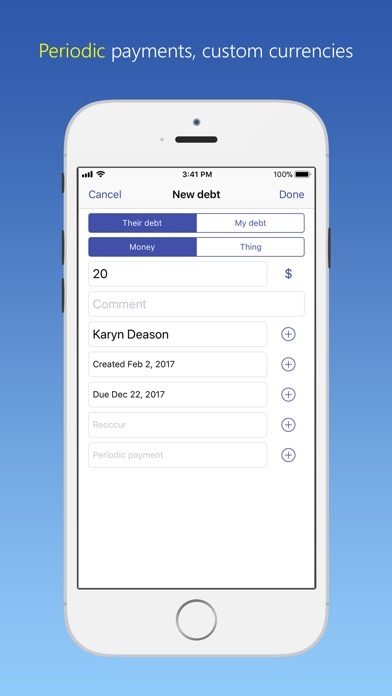 The overall flow of the app from entry of debt to paying off the debt to partial payment of debt to overpayment of debt to the actual entry of the debt is convoluted and confusing. Some rearranging of the screen and workflow of data entry is in order. It’s not a show stopper and I was able to get used to it but it definitely was a consideration when evaluating it. Had I not paid for the app I probably would not have mentioned any of these things or even bothered with a review of this nature. 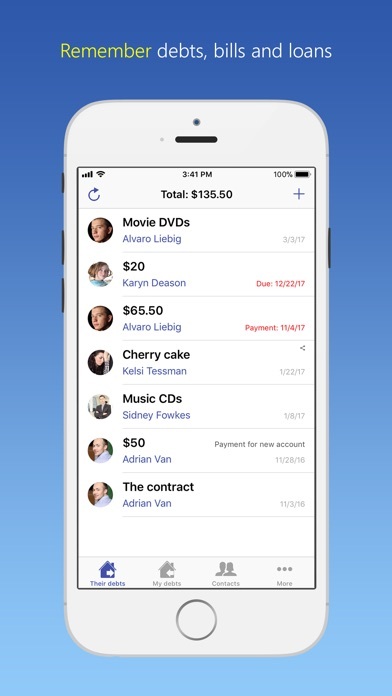 I use this app to keep track of all monies and things owed to me or that I ow others. It makes it very easy and simple. Keep up the good work. The app has potential to be a very good tool. It already appears to have many more features than most apps of this type, however I'm always guessing at what I think the app does. There isn't much in the way of documentation and although the app appears to be regularly updated, the developers don't respond to questions. I hope it continues to improve and becomes more clear as to what the features are, and how they are used. Works great no problems yet adding a few new things wouldn't hurt like backgrounds . I purchased this app for my brother and I to help keep track of iou's I paid my $3 & my brothers $3 to find out after 2 weeks they lock your data and ask for a monthly payment of $2.49 It's definitely not worth the $2.49 a month. ABSOLUTE JOKE! I think I tried 25 lending apps until I finally found this one. 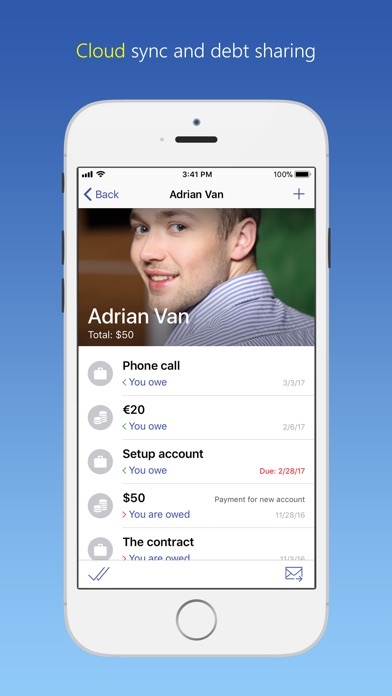 By far the best and simplest interface for lending and borrowing money. 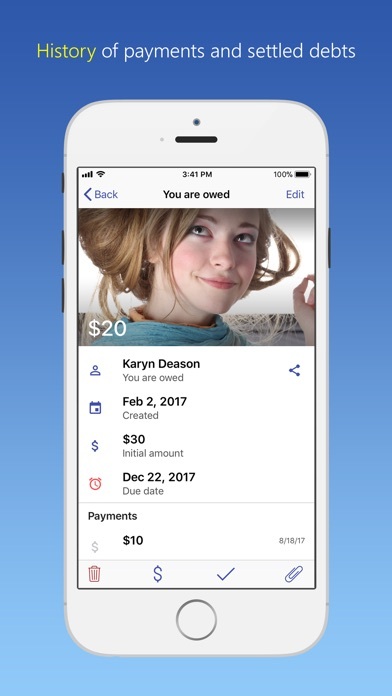 Most importantly to be able to owe or lend someone money and have the ability to make payments towards the balance and have those payments show in a easy to understand way. This app is absolutely simple yet powerful. Perfect in almost every way, the only thing I would change is the icon, a little childish for me. Thanks for a great app hope to see updates I'll be recommending this app to my friends who need a similar app.